We're excited to release four new greeting cards today! These birthday cards are the first four designs from our brand new 2017 line that we've been working on for a number of months. We'll be rolling out new products from the line in sets of 4 and 5, so keep a lookout for the new arrivals in the coming weeks and months. And don't forget to pick up a few of the new designs in the shop while your here! As you can tell from the lack of blog posts this past year, things have been exceptionally busy at the shop. This last weekend, I had a chance to make a woodcut print featuring the gorgeous Lust Script ampersand. The above process video is an abbreviated glimpse at the creation of this 8" x 8" limited edition of 40 on French Paper now available for purchase in the shop. Merry Christmas from the shop! Thanks to everyone who have made 2014 an incredible year. We really do have the best clients, friends, and supporters. May your holidays be filled with cheer and endless egg nog! Ho, ho, ho! We're so excited for the holidays that we're offering free shipping on all orders over $10 this week (now through Friday, December 12). Only available for the continental U.S. Use the coupon code XMAS2014 at checkout. Merry Christmas! Can't get enough of Dangerdom's MCM Illustration board on Pinteres. Giuseppe and Paco from Resistenza came by for a shop tour yesterday. Turns out they are fantastic type designers! Keeping your Side-Hustle and Personal Instagram accounts separate? Easily switch back and forth with Slices. Best reason to Jailbreak ever. Jerry Seinfeld delivers the most honest award acceptance speech in history. Truly refreshing & hilarious. Bravo, Norway! Your money is super pretty. Totally getting this for our dog Eleanor. She's a bitter. Integrated libraries in Adobe CC? Yes please! 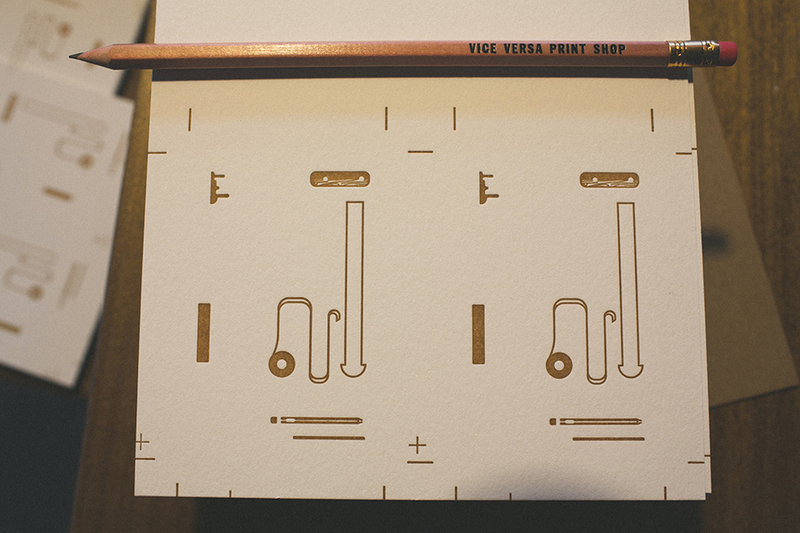 Maker love: Neon signs made by hand. Brilliant. Halt and Catch Fire from AMC has been feeding my early 80's PC War era obsession. Masterful execution of alien invasion inserted into WWI footage. Jaw dropping. Pascal Campion is an amazing illustrator. This guy's been publishing a “sketch” a day, Monday-Friday. Since 2006. Yeah. His ability to capture light, movement and story is pretty fantastic. Here’s a great write up and video about him on The Fox Is Black. I imagine my dog is up to all sorts of mischief when I’m away from the house. Just like Walter. This power cord will make my tangles beautiful. Want! How to survive New York. Brilliant! When designing in the wild… Pocket Art Director. I’d love to see a super-cut of people celebrating at the end of elaborate 1-take videos. They’re all the same. Grand Budapest Lego Hotel. Yes! Feeling low? Kanye to the confidence rescue. I had my 30th birthday five years ago today. To celebrate, I wrote, recorded and posted one song a day for thirty days and called it 30 Days and 30 Nights at Sea... A choose-your-own-musical-adventure telling the story of the final voyage of the Armageddon and her crew. It featured over two hours of new music with 9 collaborations with local musicians. I kicked it off on my birthday with chapter 1: Bon Voyage. Illustrator doesn’t have any native shortcuts for aligning elements, something I’m constantly doing while designing in Illustrator. So a few months back, I put together my own align and distribute actions and they have become some of my most used shortcuts. What better way to kick off summer than to spend the entire day outside working with wood? I had a lot of different shop projects piling up over the past few busy weeks of printing, and finally had a chance to tackle them. First up, a roller rack for holding ink rollers while die cutting or printing with only two rollers. Next up, a lower feed table shelf for holding tools and extra stuff while printing. Bonus: I'm always looking for my masking tape during makeready, so I made a horizontal tape dispenser for my "indispensable" blue tape. Now it's always at my fingertips. Magical! We're always working to improve things at the shop and bring as many services in-house as possible. So when we spotted this 1947 C&P Craftsman in Portland, we couldn't pass it up. 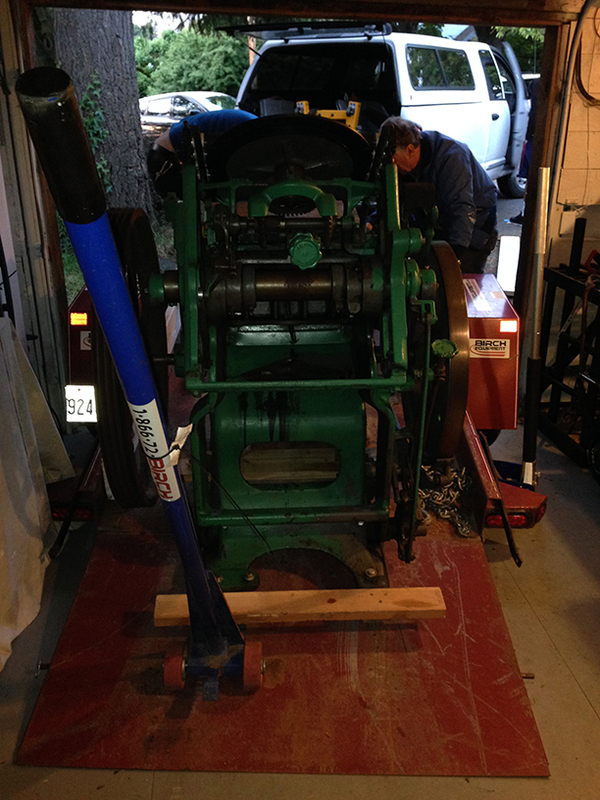 1947 Chandler & Price 10x15 Craftsman weighing in at 2,600 pounds. This green beauty is basically a newer, larger version of our old style 8x12 press with many advancements in design, improving maintenance, serviceability and output. 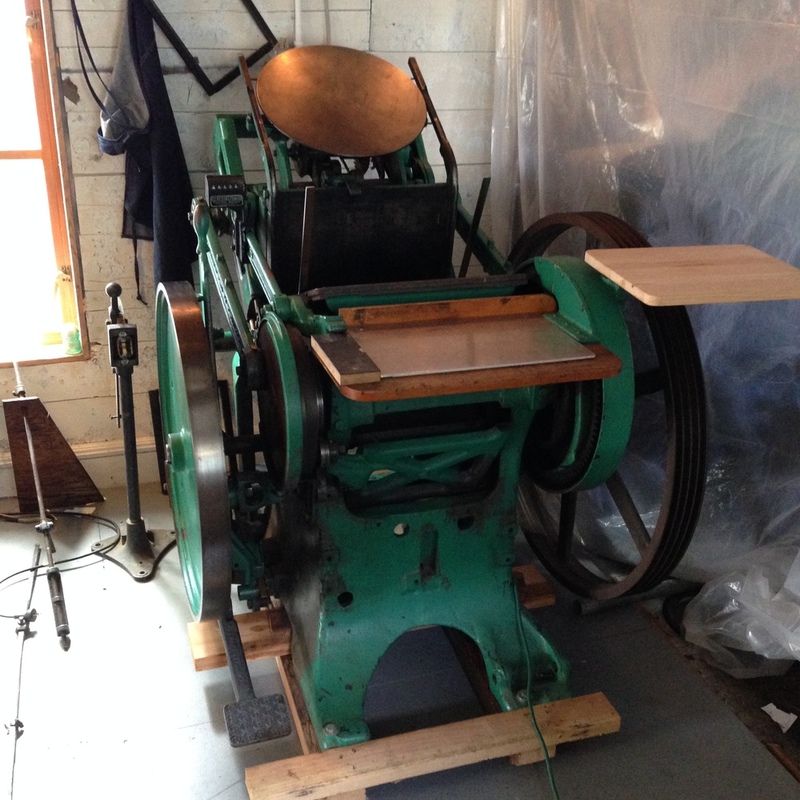 This press was last used to die cut balsa wood airplanes. The former owner purchased all the dies from the failing company who used to mass produce them for toy stores. Rad! 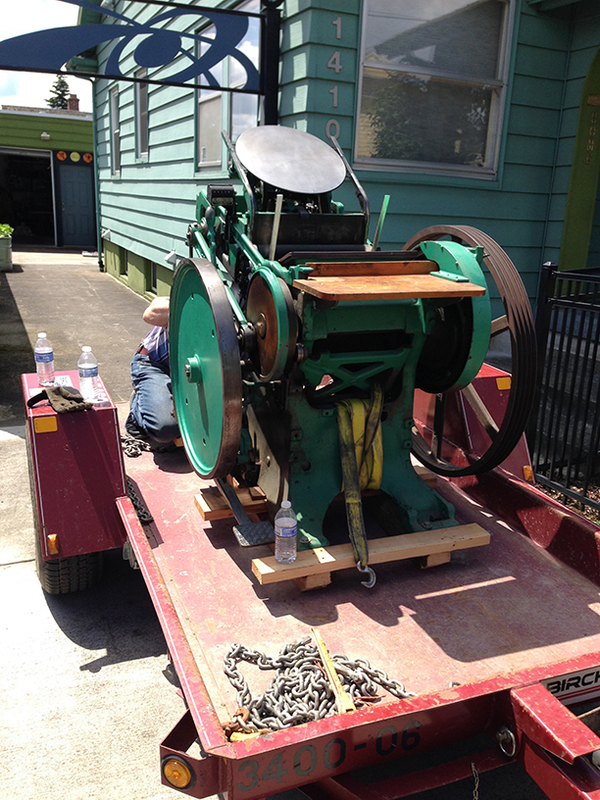 Man, this press weighs a lot, but with a come-along winch, two pipes and a Johnson bar, it only took three of us to move it safely into the back corner of the print shop. Someone in years past took the liberty to paint it a minty green leaving the out of reach parts the factory gun-metal-gray. 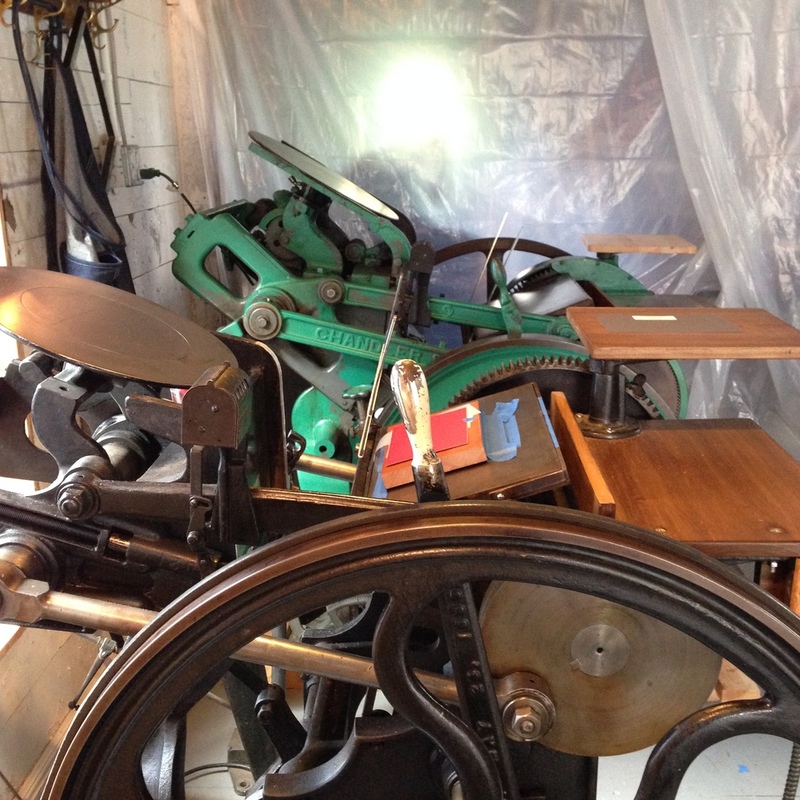 After thoroughly oiling the press and installing the single speed motor, we threw ink on the press and started tuning things up. If you didn't know, Craftsman presses have two hand dials that quickly and easily adjust the platen for alignment and pressure. The rails are also adjustable and replaceable if need be as opposed to the old style rails that have no adjustment. There are many layers of tape on our old 8x12 to to achieve good printing and the process for getting that tape job right is probably one of my least favorite aspects of printing with letterpress. Compared to taping, adjusting the rails on the Craftsman is worth the the upgrade. With a few fine adjustments and the installation of the variable speed motor, this beautiful beast will be ready to print in a matter of days. Just in time for the new project you've been think of! Illustrator of the week: Jared Chapman. Mid-Century-Modern influences? Yes and yes. 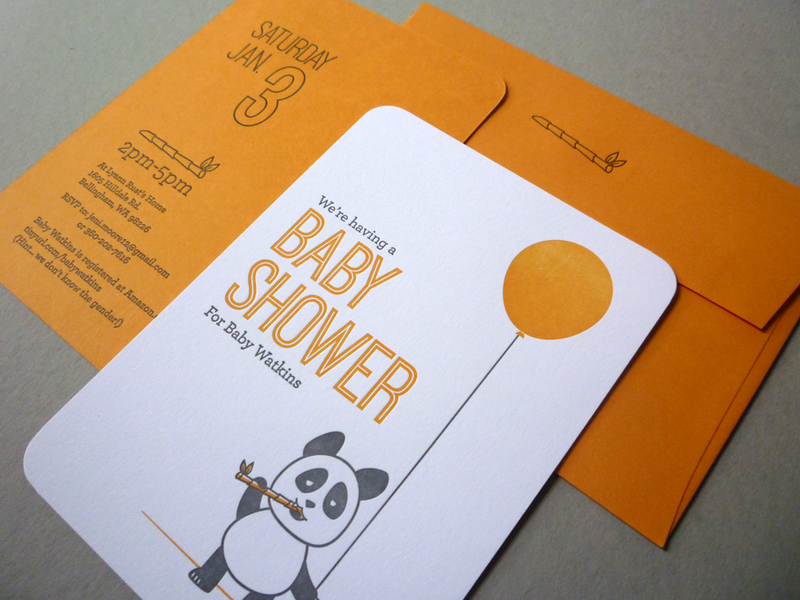 — Sister-Shop Crush of the week (you know, another print shop we wouldn't mind being pen-pals with): Spofford Press. Eric Hoffman is a talented printmaker. Looking at his etchings, you can tell he loves what he does. AND has has an awesome brussels griffon. He and Eleanor would be pals.